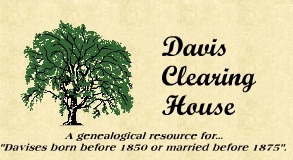 We have been gathering Davis families for the last 25+ years and are now indexing the 1850 census for Davises. We maintain a database of approximately 200,000 records covering virtually all states and portions of Canada for the surname Davis and variations Daves, Davess, Davice, David, Davies, Davise, Daviss, Deavis, Dever, Devers, Divis, Doveis, Dovis, Duis, Dawes, Dewees born before 1850 or married before 1875. If you are a Davis researcher or have a Davis married into your family, we would appreciate any of that information, especially if you have a birth or marriage date for these individuals. Please send a family group sheet with names married into and all known children, citing all sources used. Middle names and unusual names are especially helpful! We might be able to place them into a family for other researchers or even give you a report on other researchers of your extended line.